Saint Andrew's feast day is today! This feast is the marker that determines the start of Advent. The first Sunday of Advent begins on the Sunday closest to (or on) November 30th, St Andrew's feast day. That explains the first part of the Saint Andrew Christmas Novena's name. The second part simply refers to when the novena ends. On Christmas. So the longest way of saying it is: The Saint Andrew to Christmas Day Novena, but it is also known simply as the Christmas Novena for short. It is believed to be over 100 years old, and is traditionally prayed 15 times every day, though not necessarily all at once. It may be broken up to be prayed throughout the day, such as five prayers in the morning, afternoon, and evening. It is a simple and beautiful Advent prayer of preparation and petition by opening our hearts to both seek and to receive the Christ Child, and the salvation He brings on that cold, silent night. In that moment we can confidently ask God, with humble confidence, to grant our deepest longings. It is piously believed that who ever says this prayer with devotion will have their prayers answered, when or how is another matter I'm sure. But this hour and moment reminds me of another potent hour and moment when a certain good thief, on a certain Good Friday, 'stole heaven'. Being acutely aware of these 'potent moments' and offering our heart's desires, in the name of those moments, seems to be a really good practice with big results. The prayer itself is directed toward God the Father (not Saint Andrew as commonly misunderstood) and zeros in on that sacred moment when Christ, through His Blessed Mother, entered human history, and we were forever changed. The Word became Flesh and dwelt among us! So, while no one is saying to ignore or exclude Saint Andrew from our thoughts while saying this prayer, (it does begin on his feast day!) 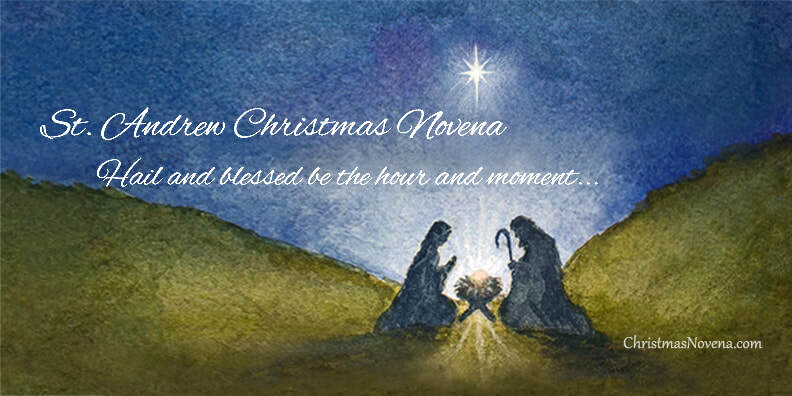 the Christmas Novena itself is actually directed toward God. I find this to be one of the shortest and most potent prayers of all time and is my favorite, albeit non-traditional, novena. Novenas traditionally only last nine days in honor of the first novena, or time of prayer, when the embryonic Church prayerfully waited in anticipation for the decent of the Holy Spirit between Ascension Thursday and Pentecost Sunday (nine days). Our word for nine comes from the Latin word novem, which is where we get novena from. Even though the Saint Andrew Christmas Novena lasts for 25 days, it still falls within the tradition of an anticipation prayer, like that first novena to the Holy Spirit. During the ever increasing noise and distractions of the Advent season, let this little prayer help keep our minds and hearts fixed on Christ's coming, so as to be more ready to receive Him on Christmas Day, and when He comes again. Please share, and join me in saying this beautiful novena all Advent long, even if you just say one prayer a day, to help be reminded of that epic hour and moment! I found that having something help me keep count to 15 with made a huge difference in staying committed to saying this prayer in its fullness, which is why I created the prayer beads for this site. Follow me on Facebook and/or subscribe below for updates about the Saint Andrew Christmas Novena, prayer beads, and related Advent topics. And do let me know in the comments if you are new to this novena or have been praying it a long time. I know many have their special stories of answered prayers and I would love to hear your story. Also, please feel free to simply list your prayer intentions to be included in our Novena prayers. The Saint Andrew Christmas Novena starts in one week! Get ready for this beautiful Advent devotion that begins on November 30th! Advent is around the corner! Free Shipping on Saint Andrew Christmas Novena beads! One month from today is the start of the Saint Andrew Christmas Novena! Can't believe it's already that time! I'm surrounded by beads and want to make sure that everyone who would like to have a set of these unique and exclusive beads to aid them in praying this beautiful novena gets one in time! So, I'm offering FREE USPS Priority Shipping on all beads, (no matter the order size! ), on any orders placed now through November 16, for delivery in time for the start of the novena. Just enter code FSNov18 during checkout. Browse beads here. I have a limited supply of certain beads and medals, so be sure to get your orders in early if you have a favorite. If you have any special requests for designs or sizes, let me know that too, the earlier the better. Very much looking forward to meditating on this beautiful season of hopeful expectation and praying this very calming and focusing novena! Hope you'll be able to join me! Rejoice! Tonight our dear Savior comes! No matter how hectic or distracted our Advent has been, let us make a conscious effort to find some stillness before the Christmas Liturgy to make a special place in our heart for Our Lord to be born anew in us. Happy feast of St John of the Cross! ​I had only ever seen it reproduced on prayer cards and book covers, and so I was both surprised and overwhelmed to see it in person. It's so much smaller than I imagined, barely a few inches at it widest! It is preserved in a reliquary stand (with a fragment of his bone visible underneath) and sits in a glass cabinet filled with other objects and relics from St Teresa of Avila during his time as confessor at that monastery in Spain. The image is of the moment Christ breathed His last, and the vantage point is from above, as if God the Father is looking down on the sacrifice of his Son. The feast of St John of the Cross falls during Advent and this image now will forever be associated with Advent for me, as a foreshadowing of the whole purpose of Christ's coming: in order to redeem us. During our Christmas Novena prayer, I have been imagining God the Father looking down on the Nativity scene to witness His Son's birth, and knowing full well, the price He will pay to redeem us. What a selfless gift God has given us! What love He has for us! For today, we too can have in the back of our mind, both images as seen from above, from God the Father's perspective, the arc from the Nativity to our Redemption in a single moment. St Nicholas Day GIVEAWAY! Win this beautiful Saint Andrew Christmas Novena Bracelet! ***Bonus 20% SAVINGS open to all within USA: Use COUPON code: NICK202017 while supplies last, from Dec 6 through to Dec 13, the Feast of St. Lucy. Coupon extended through Friday Dec 15! However, NO purchase is necessary to enter giveaway. This is just an extra offer in case you didn't win, but would still like to get in on a deal for yourself, or gift some prayer beads to a loved one for Christmas. Browse prayer beads here. The winner of the bracelet, that honors Our Lady of Guadalupe's sign of roses, will be announced on Dec 13, St Lucy's day. The winner will receive an email informing them of their win and will need to respond via email within 48 hours to claim their prize. Email announcing winner has been sent out, and awaiting reply from winner. Coupon has been extended through Friday Dec 15! By submitting your name and email to ChristmasNovena.com, (operated by Renata Grzan Wieczorek at For the Love of Beauty, LLC), you grant permission to For the Love of Beauty, LLC to contact you for communications regarding this current Giveaway and for occasional updates and special offers. Should you wish to no longer receive future updates and special offers, you can always unsubscribe. Under no circumstances will your name and email be shared with third parties. The Ideas that Inspired the Designs of my Saint Andrew Christmas Novena Prayer Beads. Use COUPON code: NICK202017 through Friday Dec.15, while supplies last! and be easy (ergonomical) to use, and to maintain. I wrote about this before, but here is more detail about why I needed to create these novena beads in the first place. The goal initially was to just eliminate the obstacles to saying it, so that I had a better chance of staying committed to finishing this unique novena. When one becomes distracted with trying to keep count, it's easy to lose focus and a prayerful disposition. At least that's what happens to me! I'm sensitive and contemplative by nature, so little things can distract me very easily. Keeping 15 prayers accounted for was always frustrating without a dedicated tool and trying to use an imaginary third hand was not helping. It was almost impossible if I left praying the novena at night, in bed. If this describes any of your experiences with this novena, you might find these prayer beads helpful. Years ago I found nothing out there I could buy, except for one rare set of beads that was sold out, and featured a medal of St Andrew- not the best interpretation unfortunately. (See my post on the meaning and misconception about this novena.) So after the first hasty set of beads that I made for myself (out of desperation halfway through Advent several years ago), my imagination began to percolate on how I can make another set that was better and more beautiful, more meaningful, and more lasting! One of my goals was simply a functional one. To create a smooth, distraction free, sensory experience while using the beads by selecting proportionally sized prayer beads, along with their corresponding spacers, so that you would always know where you are, even if you are saying the prayers in the dark, like in bed. (Particularly helpful for the visually impaired, I might add!) Some beads I have used over the years, on different rosaries or chaplets for example, are too close together or are too far apart, and so the fingers do not move over the beads naturally so as to comfortably rest on them, and therefore, end up being more of distraction rather than an aid to prayer. I've tried to wear rosary bracelets before (with clasps) but they always seem to be a pain to put on and off with one hand. I never warmed up to memory wire either (even though they seemed so cool! ), because I preferred low profile/low impact bracelets, so that I could keep the bracelet on all day and not have it clank around so much and get in the way of my daily activities. Stretch chord bracelets then became a favorite, simply for the ease of getting them on and off. It increased the chances of ultimately actually using them to pray with because I was more likely would wear them, and thereby be reminded to pray. I didn't however, like the quality of typical commercial stretch chord prayer bracelets and how they were finished. They used an inferior chord that always frayed and eventually gave out, and the knot was always visible and took away from the aesthetic of the design. Not to mention, so many silver plated small parts that were impossible to keep looking bright over many years. I sure set pretty high requirements for myself! I searched for the most sturdy stretch chord I could find, that still fit the bead hole, and tied the knot as securely as possible (with a dab of glue) and hid it inside the bail that holds the pendant/charm, for both extra security and aesthetic value. I used silver colored spacer beads that are made of fire-polished Czech glass or crystal instead of silver plated spacers common used, so the beads will maintain their sparkle and age beautifully. The medals are made either of an affordable nickel free zinc alloy that will maintain it's color, or solid sterling silver that is easily cleaned, with a polishing cloth, since it is on the end of the bracelet. By creating multiple sizes for better fit options, and with common sense mindful usage practices (like rolling the bracelet on and off on your non-dominant hand instead of pulling on it hard when taking it on and off), my stretch chord bracelets can last for many Advents to come! So here's a little about the anatomy of my prayer beads, the components I chose, and some of the symbolism behind them. Other than the olive wood beads, which will be discussed later, all the other beads come in a beautiful shade of purple or violet, the color designated for the liturgical season of Advent. I searched only for the best colors and materials that would reflect the simplicity and dignity of this novena prayer. The carol (one of my all time favorites! ), refers to the prophecies in Isaiah 11:1 of "... a shoot shall sprout from the stump* of Jesse, and from his roots a bud shall blossom." This particular deep violet, rose bud set of beads (that evoke a dark midnight sky) has two designs: one, where all the 15 beads run together (great for people who like to say the novena all at once) and another, where the beads are divided in 5 sets of 3, (great for those who like to divide up their prayers three times a day, or just to know their place better while saying it, or simply just like the look of it!). The spacer beads I carefully selected are made of silver colored fire-polished Czech glass that help evoke the starry night sky that surrounds the Star of Bethlehem. With the other two designs, the chaplet and the strand, the beads are strung on very strong yet flexible nylon coated wire. I created one bead set that is a chaplet (i.e. not to be worn as a bracelet), simply out of recognition that not every woman may like to wear bracelets, and that men pray this novena as well, and can also use the aid of beads. (The chaplet and the strand bead sets were specifically created for these reasons.) The chaplet uses heavier semi precious amethyst stone beads with an elaborate medal of the nativity with the Star of Bethlehem. For the bead set that is not a chaplet or bracelet, but a single strand, I chose to use olive wood beads from Bethlehem, in order to particularly put us in touch with actual matter from Bethlehem, like a relic as it were. It also symbolizes the wood of the Cross, the instrument of our salvation for which Christ came, and the material of the trade of St Joseph the carpenter. St Joseph, the protector and guide of the Holy Family can be our guide and strength when we are weary on our spiritual journey to Bethlehem. That is why the strand begins with the Star and ends with a medal of the Madonna and Child. This is also the suggested method to use the strand beads set during prayer: to start with the Star and follow it to Our Lady holding the Infant Jesus. Hematite was used as spacer beads on this set, partly because I saw it all over on my trip through he Holy Land, and partly because it looks like strong metal and give the overall sense of the strength of St Joseph. The symbol that is featured on all the prayer beads is (or contains) the Star of Bethlehem, in two traditional Christmas versions: either as a comet, as in Italian renaissance art and traditional Italian nativity scenes, or as the stationary North Star more familiar outside of Europe. The star, as described in the Gospel of Matthew, inspired the Wise Men (also known as the Magi, or Kings from the East), to seek out it's meaning. God chose to speak to the Magi through signs they were already familiar with, the signs of the heavens and the prophesies they had studied. Inspired by the great wonder this particular star pointed to, they left all behind and set out to follow it. In the darkness of these anticipatory winter days of Advent, like the Wise Men, we can look to the Star of Bethlehem as our inspiration as well. What signs or means does God use in our lives today, that we are familiar with, to point us towards His Son? We can be inspired by the Magi to pay attentions the signs around us, our metaphorical star, and set out on a journey to seek the new born King. It's a fruitful spiritual disposition to cultivate during Advent, (and indeed everyday) the attitude that we are on a journey, seeking to be with our Savior. So whether you enjoy the simple beauty of the violet Czech glass, or amethyst stone beads, the delicate rosebud beads that evokes Our Lady, or the strength of St Joseph with the olive wood beads, praying with For the Love of Beauty brand beads, offers a genuinely rich experience of contemplation during the Saint Andrew Christmas Novena and Advent Season. If you have one of these prayer bead sets, let me know what you think, or if you'd like one yourself, let me know your favorite designs. I can also try and custom make a bracelet for you as well if you like, just send me a note! Either way, looking forward to hearing from you! For those of you who will be lighting an Advent 'wreath' this weekend, especially with tapers... remember to start with the purple candle 'opposite' the pink one in order for the progression to the pink one for the third week to look accurate. This also makes the candles burn down in successive order, which makes the visual impact of the wreath (which is the point of it) better match the progression of weeks in Advent, and therefore aid in better contemplation of the sense of time advancing. Hope that makes sense! Happy first week of Advent and Happy Liturgical New Year! ​O Come, O Come Emmanuel! The day is finally here! Saint Andrew's feast day! This feast is the marker that determines the start of Advent. The first Sunday of Advent begins on the Sunday closest to (or on) November 30th, St Andrew's feast day. That explains the first part of the Saint Andrew Christmas Novena's name. The second part simply refers to when the novena ends. On Christmas. So a longer way of saying it is: The Saint Andrew to Christmas Day Novena. Kind of long, which is why it's also known simply as the Christmas Novena. Some people mistakenly think they are praying to St Andrew while praying this novena, surely, and innocently due to it's initially peculiar sounding title. Understandable. But just to be clear, while no one is saying to ignore or exclude Saint Andrew from our thoughts while saying this prayer, the Christmas Novena itself is actually directed toward God. It is a short, simple, and beautiful Advent prayer that is traditionally said 15 times a day and zeros in on that epic, sacred moment when Christ, through His Blessed Mother, entered human history, and our destiny was forever changed. It's an amazing visual! ...at midnight, in Bethlehem, in piercing cold! The repetition of the prayer really drives home how cold, dark, and isolated that moment was: when the most omnipotent being, the Son of God, in the dark of night slipped quietly into this side of the veil, through an extraordinary young woman. By those words, we allow ourselves to focus our hearts and minds squarely at that moment and just let ourselves 'be' in awe of the humble beginnings of our salvation and redemption, at midnight, in Bethlehem, in piercing cold. Just breathtaking! The prayer continues, In that hour, vouchsafe, O my God! to hear my prayer and grant my desires... At the most ripe, fruitful, and potent moment in human history up to that point, we are invited to present the desires of our heart. Could there be a more hopeful time to entrust our needs in? As salvation history begins to unfold, we have reason to allow ourselves to confidently hope for the fulfillment of our present needs, as well as joyfully look forward to the Second Coming. The season of Advent doesn't exist just to prepare us to commemorate the historical coming of Christ 2000 years ago, but Advent is also meant to help us prepare ourselves for Christ's Second Coming as well. It is in that hopeful space of the promise of Christ having already come, and also coming again, that we search our hearts for our deepest desires and confidently present them to God Himself in virtue of His Son's birth. Who can say no to all that? It is piously believed that who ever says this prayer with devotion will have their prayers answered, when or how is another matter I'm sure. But this hour and moment reminds me of another potent hour and moment when a certain good thief, on a certain Good Friday, 'stole heaven' as they say. So, practicing the presence of being acutely aware of these 'potent moments' and offering our heart's desires, in the name of those moments, seems to be a really good practice with big time results. The prayer concludes with, through the merits of Our Savior Jesus Christ, and of His Blessed Mother. Amen. At the time of His birth, an admittedly a joyous celebration, we are reminded of the means of our salvation by the word 'merits'. Christ won our salvation by crucifixion on the cross, a sober reminder of the cost He paid for our sins. And all this Our Lady consented to with her first 'yes'. It was prophesied by Simeon that a sword would pierce her heart, that she would suffer also. She, in essence, co-redeemed us with her Son, which is why she is also known as Mediatrix of All Grace, because it was through her that Christ was born, and through her we continue to receive the merits of salvation. This is good to remember as we: commemorate Christ's birth historically, experience Christ every day, as well as how we look towards the promised Second Coming of Christ, that the most pure Virgin Mary, continues to have her hand in presenting her Son to us, along with the graces He wants us to have. Why 15 times a day? No one really knows, but I'll take a pious stab at some possibilities. The prayer is believed to be over 100 years old, and is traditionally prayed 15 times every day, though not necessarily all at once. It may be broken up to be prayed throughout the day, such as five prayers in the morning, afternoon, and evening. This kind of reminds me of the original 15 decades of the rosary, which was itself seen as a potential simplified version of praying the 150 psalms that are still sung by religious in monasteries and convents praying the Divine Office. There you go, not official, but it could explain why 15 times. Not to mention that the 15 repetitions a day definitely drives home the visual of how blessed that hour and moment was at midnight, in Bethlehem, in piercing cold, so much so, that those words just seem to waft in the subconscious all day long. Which is why it's such a perfect Advent prayer of preparation and petition. It helps to keep the scattered mind focused on spiritually preparing for Christmas during the busy and noisy modern holiday season. I find this to be one of the shortest and most potent prayers of all time and is my favorite, albeit not traditional, novena. Novenas traditionally only last nine days in honor of the first novena, or time of prayer, when the embryonic Church prayerfully waited in anticipation of the decent of the Holy Spirit between Ascension Thursday and Pentecost Sunday (nine days). Our word for nine comes from the Latin word novem, which is where we get novena from. Even though the Saint Andrew Christmas Novena lasts for 25 days, it still falls within the tradition of an anticipation prayer, like that first novena to the Holy Spirit. My next post will be about the specific symbolism that I chose for each design of my beads to help deepen the overall prayer experience. And do let me know in the comments if you are new to this novena or have been praying it a long time. I know many have their special stories of answered prayers and would love to hear your story.